Our platform staff are involved with ensuring trains are dispatched safely by assisting the on-train crew. Doors must be closed securely before a train departs and any intending passengers must have either alighted or boarded. Severn Valley Railway trains run to a published timetable and timely departures ensure that there are minimal delays over the course of a day. With staff assistance, most areas of the station and platforms are accessible by wheelchairs and large pushchairs, however, please consider that our station was built in 1870 and modern structures and aids may be detrimental in preserving the ambience of a bygone age. 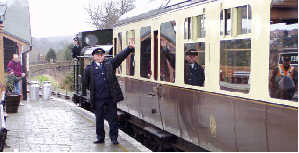 The Severn Valley Railway operates three dedicated wheelchair friendly coaches and portable ramps are available at the station. Recently, the barrow crossing at the South end of the station has been replaced with a modern rubber material. Full disabled facilities are located within the purpose built Kidderminster station, though at Bewdley, we regret we are currently unable to offer a full range of facilities. All the Severn Valley passenger carrying vehicles are fitted with manual door handles. Most types are operated by dropping the window and turning the door handle fitted to the outside of the vehicle. Only the diesel multiple unit is fitted with a type that may be opened from the carriage interior. Station staff and train crew will not allow a train to depart with any door not properly closed. The handle must be in the horizontal position and the door flush to the side of the carriage. Visitors are kindly requested not to board or alight moving vehicles at any time. Particular care must be taken with our traditional Great Western coaches which feature a simpler design of door lock without the more familiar “slam door” type of catch. Great Western doors must be closed before turning the handle manually back to the horizontal position and may be stiff because they have a strong spring.